The nearby home of opposition legislator Sergio Vergara was also raided. He was briefly detained. The operation could signal a crackdown on the opposition by embattled President Nicolás Maduro, analysts say. Mr Guaidó, head of the opposition-controlled National Assembly, declared himself interim leader on 23 January, saying Mr Maduro's re-election last May was illegitimate. On Twitter, he said Mr Marrero had been "kidnapped" and that "two rifles and a grenade had been planted" at his aide's home during the raid at about 02:00 local time (06:00 GMT). Speaking at a press conference on Thursday, Mr Guaidó said "we won't be intimidated" by what he described as a "vile, vulgar kidnapping". He said Mr Marrero's arrest "won't make us deviate from the path we are on" and asked Venezuelans to "stay united and mobilised". US Secretary of State Mike Pompeo condemned the raid and called for Mr Marrero's immediate release. "We will hold accountable those involved," he said on Twitter. Mr Vergara, who lives in the same building, said more than 40 heavily armed officers from intelligence agency Sebin took part in the raids on his and Mr Marrero's apartments. Mr Vergara added that his driver had also been detained. Mr Marrero is Mr Guaidó's main political adviser and his detention is likely to raise tensions both within Venezuela and internationally, the BBC's Will Grant in Caracas reports. Mr Guaidó and Mr Maduro each claim to be the constitutional president of Venezuela. 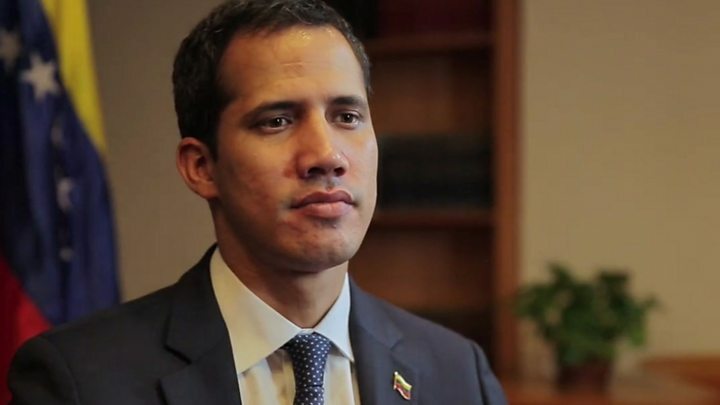 Media captionJuan Guaidó speaking to the BBC last week: "We want genuinely free elections"
Mr Guaidó has continued to call for President Maduro to step aside and urge the security forces, which have mainly been loyal to the government, to switch sides. Last week, the chief prosecutor said it had asked the Supreme Court to investigate Mr Guaidó for allegedly sabotaging the country's electrical system in the wake of this month's power cuts. Mr Guaidó has been recognised as leader by more than 50 countries, including most in Latin America and the US. Mr Maduro, who still has the support of China and Russia, accuses the opposition of being part of a US-orchestrated coup.